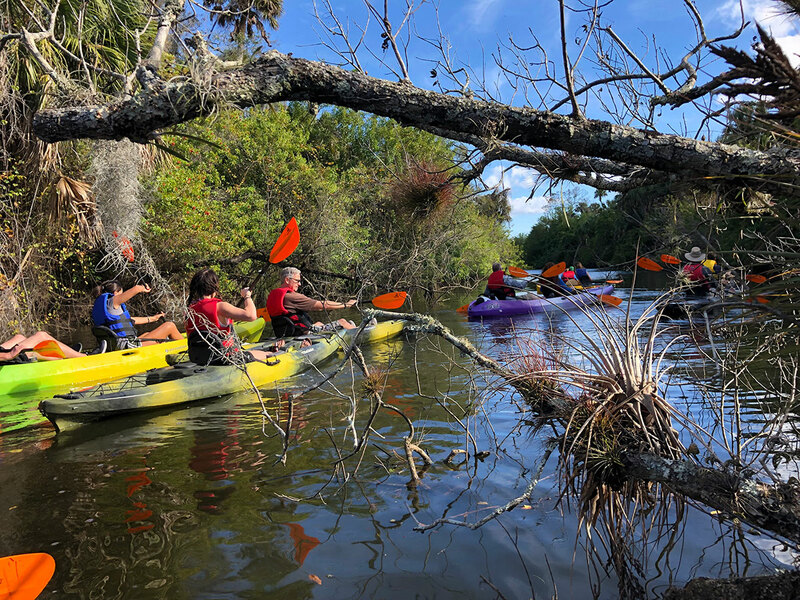 The North Fork of the St. Lucie River presents some interesting challenges as kayakers navigate their way through narrower areas. The Indian River Lagoon and North Fork of the St. Lucie River are recipients of all substances carried into them, whether fresh rainwater or runoff from leaky septic tanks, feces from pets and wild animals, phosphorus from fertilizers or nicotine-filled cigarette butts dropped carelessly on the ground. With a $28,026 grant in hand from the Indian River Lagoon National Estuary Program, Oxbow is developing a multi-pronged approach for its Water Champions Initiative in collaboration with other local organizations and agencies. While the grant is funding the first-year start-up of the program, Bogan foresees that the program will be able to continue after that using the Oxbow’s own budget. Oxbow had stiff competition for that grant. Fifteen organizations applied for some of the $100,000 the program made available. Only three were awarded grants, and the Oxbow proposal was ranked No. 1. Oxbow was up against projects submitted by Harbor Branch Oceanographic Institute, the Marine Resources Council, the Florida Institute of Technology and others. 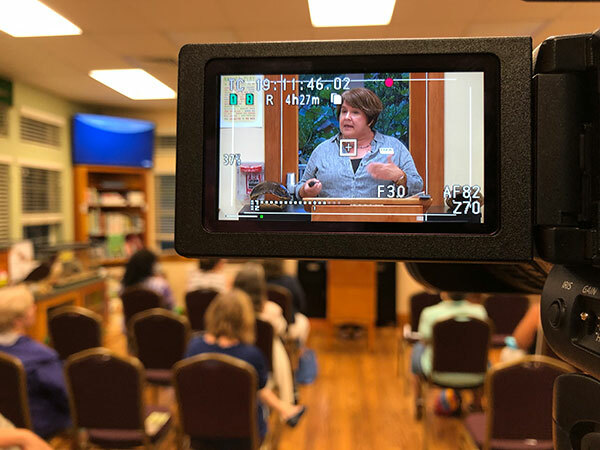 Dr. Beth Falls from Ocean Research and Conservation Association teaches the audience about toxic blue-green algae that sometimes blooms in the Indian River Lagoon. Collaborative effort with other organizations is helping to develop the program. 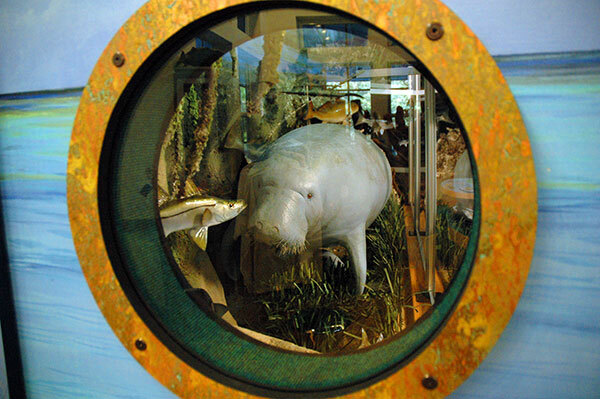 A life-size diorama inside the Oxbow education center is used for teaching. Here, a curious fish looks at a manatee. The Indian River Lagoon Aquatic Preserves office in Fort Pierce is offering some ideas for the training course and for special topics, such as how people can reduce their use of disposable plastics. “The Water Champions program is an example of how collaboration can create a robust learning opportunity for the community,” says Emily Dark, an environmental specialist in the preserves office. First comes a day-long free Water Champions 101 training course that ends with a certificate. Providing an overview of the waterways in the county, it teaches participants about the challenges faced and how they can make a real difference. Their efforts count: by keeping the water clean, they help protect the health of all who depend on it, including humans, wildlife, fish, birds and mammals such as dolphins and manatees. Participants learn how to use environmentally safe methods to take care of their home or yard. They will learn about the history and ecology of the wetlands and waterways, find out what the local governments are doing to improve the health of the rivers and lagoon and learn how they can help to create a better future for the lagoon and its tributaries. Graduates can take the Water Champions Captains course to learn to be leaders so that they can begin teaching others. For example, a captain might man a booth at a festival or speak at homeowner association gatherings. “For the Love of Florida,” a series of talks at the Port St. Lucie Community Center by experts who bring humor and anecdotes along with easily understood science, is open to all who want to learn more. Other Water Champions components include demonstrations — for example, how to make a rain garden to allow water to percolate downward after a rain — and volunteer projects of all kinds, from helping with landscaping to removal of unwanted vegetation in sensitive areas. Next season, probably starting in October, Oxbow will feature training in specific topics to match the interests of participants. Algae blooms are a good example, says Erin Cartmill, one of the Oxbow staffers who is helping to develop the program. The toxic algae that made appearances in recent years demonstrates how quickly water quality can turn from good to terrible and, in the process, kill fish and harm mammals, including humans and pets. Workshop demonstrations are also part of the Water Champions program. “Anytime we do something we relate it to water,” Cartmill says. Participants might learn how to build a birdbath and take care of it, or how to build something to catch rainwater. A new Oxbow education coordinator is updating curriculum for elementary school-age kids. 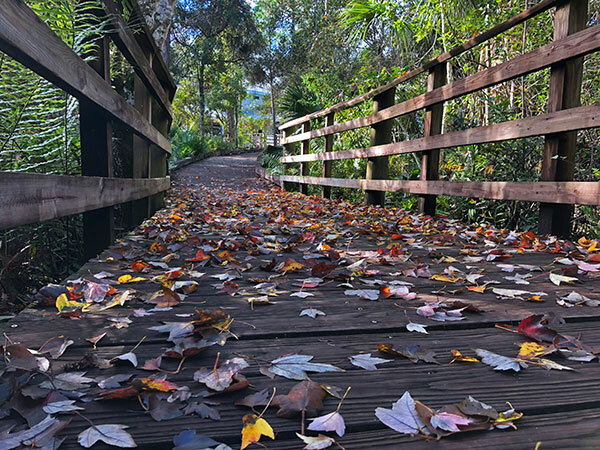 A picturesque collection of multi-colored December leaves covers a boardwalk at the Oxbow Ecocenter. The boardwalk lifts hikers above a wetland slough that leads to the North Fork. A media campaign is also planned. It may include focus groups to see what message the Oxbow should send out about the Water Champions program, the use of social media, advertising and more. In Martin County, a Water Ambassadors program has been in existence for three years. To become an ambassador, a participant must take a six-hour course hosted by University of Florida’s Institute of Food and Agricultural Sciences that teaches the state’s drainage history, Florida-friendly landscaping, what to do and not to do if you live along the estuary, how to reduce runoff from one’s own property and the dos and don’ts of fertilizer use. The program is funded by a grant from UF/IFAS extension Sea Grant office. Oxbow is owned by St. Lucie County but is within Port St. Lucie city limits. It works closely with the county, Port St. Lucie and Fort Pierce as well as organizations like the Conservation Alliance of St. Lucie County, the Aquatic Preserves division of the Florida Department of Environmental Protection, the UF/IFAS Cooperative Extension, health department and others. Oxbow Eco-Center opened in 2001. It features a “green” education center made partially of recycled materials, including salvaged pine trees from the St. Johns River and a bouncy entrance path made of recycled tires. The building sits on a 225-acre preserve on the North Fork of the St. Lucie River. Wide trails wander around the preserve, along with boardwalks and observation towers. The trails are open from sunrise to sunset. 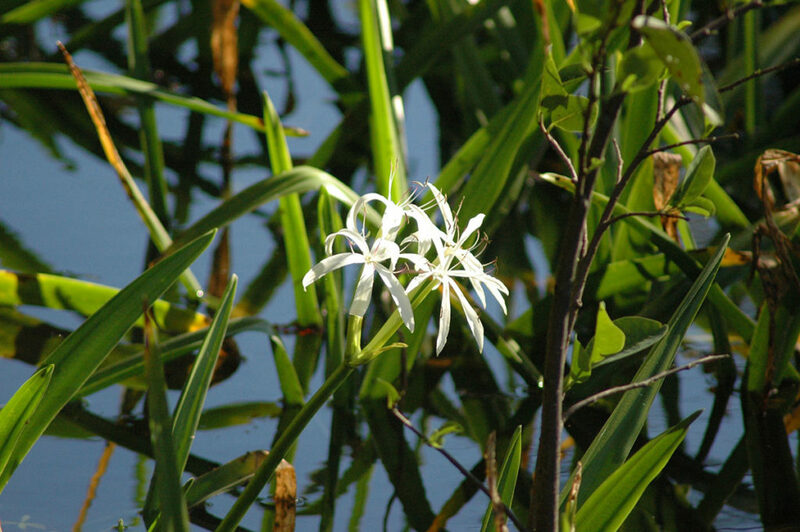 A lovely swamp lily blooms in Becker Preserve. 1. Oxbow Eco-Center: Water Champions Initiative. Grant: $28,026. Local matching in-kind funding: $33,410. Total project cost: $61,436. 2. Florida Oceanographic Society in Stuart with an oyster restoration education plan. Grant: $19,751. Matching local contribution: $18,083. Total project cost: $37,834. 3. Pelican Island Audubon Society in Indian River County for a plan to teach people to change their behavior to improve the habitat of the lagoon. Grant: $25,000. Matching local contribution: $88,284. Total project cost: $113,284.